So, I added these 6 shades in my cart along with few blush-on which i will review later ... and guess what ? I got free Limited Edition Eye shade " BirthDay Girl". Okay ! 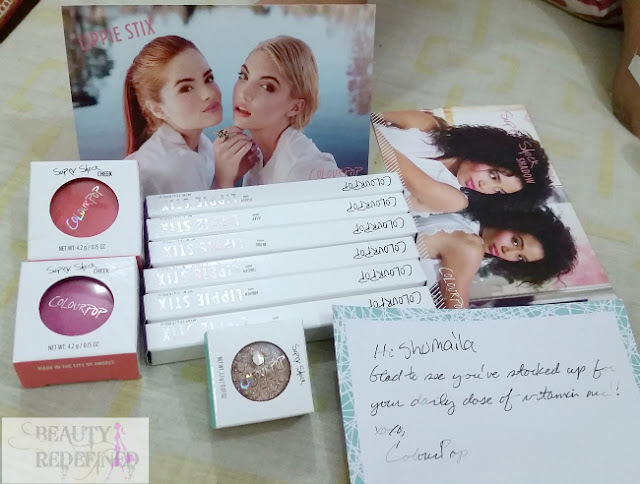 enough of blabbing and let's get to the review and see what I have to say about my first ever lippie stix by ColourPop. We’ve made it easy for you – every Lippie Stix has a matching Lippie Pencil that was designed to match its partner perfectly. However, we’re not trying to be a bossy pants and tell you creative lovelies what to do. So, if you want to create an Ombre lip look or something, have fun mixing and matching & do your thang! CREAM FINISH Full coverage lipstick that leaves an ultra creamy feel and look on your lips. Tuxedo : (Hyper Glossy): Cool toned neon pink. and a Exact dupe of MAC Candy Yum Yum but in Creamy finish. Rocket : (Satin) : It's a soft bright pinky coral. Brunch : (Satin) : Super bright coral that can lean more pink! Blood : (matte) : A deep burgundy red / wine. Julep : (Cream) : its a bright red. They comes in variety of finishes ranging from "Hyper Glossy" to " Matte"
The Packaging of these lippie stix is quite simple yet cute. They comes in a white retractable pen like tube and comes in a white cardboard box which have holographic printed name of the brand. These lippie stix feels so creamy and smooth in texture and glides smoothly on the lips without tugging even the mattes ones does not tug. The color payoff is good and it provides medium to full coverage in just 1 -2 swipes and last for around 3-4 hours easily and then leaves behind a stain. About the Smell of these lippie Stix, it's gorgeous I just kept smelling the swatches for the love of the smell. I read on a fellow blogger's post that "this lippie stix is a strong annoying smell" It was such a turn off for me since i Order quite a few shade But Happily I would say quite contrary to this as they smell like butter cup cake. Okay i dont know how to define smell but its amazing which fades away after a while though. 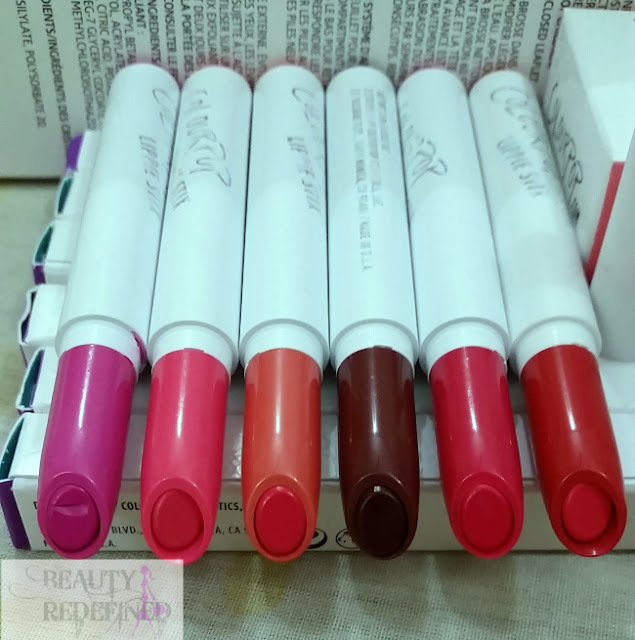 I am really happy with my purchase and I am definately buying few from their newly launched Matte range ... Okay ! 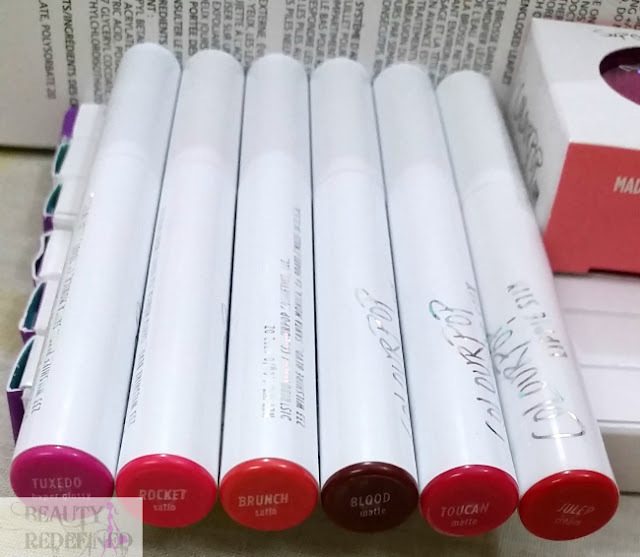 enough of blabbing and let's get to the review and see what I have to say about my first ever lippie stix by ColourPop. Have you tried these lippie stixs ? what would you say about the smell ? OMG! The colours are soooo beautiful! Love the post! You got some really pretty colors. I am definitely going to pick some :) Great review and swatches. 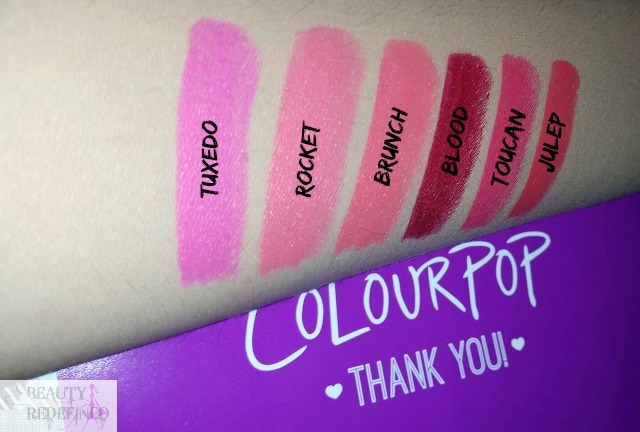 Omg what an amazing swatches its my the fav blog now i am amazed to see such perfect swatches you tempting me love every bit of your blog amazing amazing job i have not used any colorpop lippie but i can choose now easily. 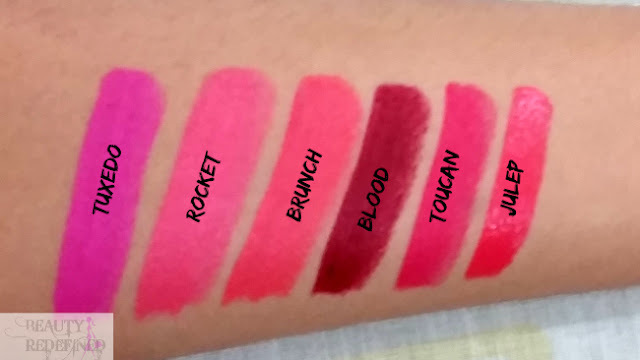 Love the swatches and your post was really helpful in making my mind to invest in these lippies. Love the brunch and toucan one. Awesome swatches. I am in love with all colors. I also wouldn't have left a single one and bought all like u did. Nice post.